Crystallins are separated into two classes: taxon-specific, or enzyme, and ubiquitous. The latter class constitutes the major proteins of vertebrate eye lens and maintains the transparency and refractive index of the lens. The former class is also called phylogenetically-restricted crystallins. CRYZ is a taxon-specific crystallin protein which has NADPH-dependent quinone reductase activity distinct from other known quinone reductases. It lacks alcohol dehydrogenase activity although by similarity it is considered a member of the zinc-containing alcohol dehydrogenase family. Unlike other mammalian species, in humans, lens expression is low.Crystallins are separated into two classes: taxon-specific, or enzyme, and ubiquitous. The latter class constitutes the major proteins of vertebrate eye lens and maintains the transparency and refractive index of the lens. The former class is also called phylogenetically-restricted crystallins. This gene encodes a taxon-specific crystallin protein which has NADPH-dependent quinone reductase activity distinct from other known quinone reductases. It lacks alcohol dehydrogenase activity although by similarity it is considered a member of the zinc-containing alcohol dehydrogenase family. Unlike other mammalian species, in humans, lens expression is low. One pseudogene is known to exist. 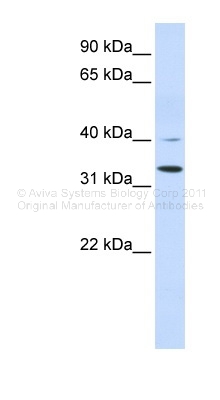 CRYZ polyclonal antibody (A01), Lot # 060707JCS1 Western Blot analysis of CRYZ expression in HL-60 ( Cat # L014V1 ). Western Blot analysis of CRYZ expression in transfected 293T cell line (H00001429-T01) by CRYZ MaxPab polyclonal antibody.Lane1:CRYZ transfected lysate(36.19 KDa).Lane2:Non-transfected lysate. 14 products - FILTER YOUR RESULTS!